Just because I could never afford this high-end 800 Series Diamond speaker from Bowers & Wilkins doesn't mean I can't enjoy looking at it, and giggling at the phrase "diamond dome tweeter." The seven new speaker sets are all pricey, so we may as well talk about the flagship 800 Diamond, which is apparently the latest generation of the speakers used at Abbey Road Studios. That doesn't necessarily tell you anything about how they sound, but for $24,000 per pair you should expect a good conversation starter or two thrown in. The bass is "significantly improved," thanks to a new voice coil and bass realignment, and the entire range of new Diamond Series products are outfitted with diamond tweeter technology. At the low end, the 805 Diamond costs $5,000 per pair, which isn't so terrible, if you're down with the aesthetics. Otherwise, though, this is one of those look-don't-buy, high-end audiophile systems that most of us can listen to in our diamond dome tweeter dreams. 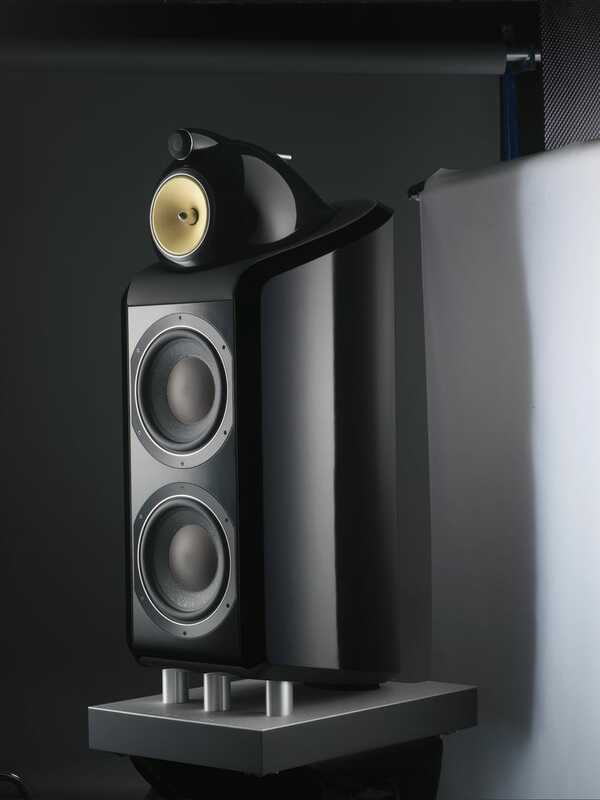 Bowers & Wilkins 800 Series has long provided the benchmark by which all high-end speakers are judged. Five generations of 800 Series have offered an unbeatable combination of outstanding performance, the latest audio technology and stunning aesthetic design. Now the 800 Series Diamond builds on that legacy, with vastly improved performance across the board and for the first time the inclusion of a diamond dome tweeter in every speaker in the seven-model range. Bowers & Wilkins is proud to announce the launch of the 800 Series Diamond. The first new incarnations of the legendary 800 Series for six years brings Bowers & Wilkins closer to the ultimate ambition of its founder, John Bowers – to create a transducer that truly neither adds to nor subtracts from the original signal. The 800 Series has long been the world's premier high-end loudspeaker range. Designed for the home, but offering levels of quality such that the most demanding recording and mastering studios in the world choose to use them. Abbey Road Studios in London and Skywalker Sound in California both use Bowers & Wilkins 800 Series. The already unrivalled levels of performance are boosted by the implementation of Bowers & Wilkins' famous diamond tweeter technology throughout the whole range, including the new 805 Diamond, a speaker that brings diamond tweeters into the range of more discerning listeners than ever before. Further major advances in audio-critical areas provide the entire range with a dramatic leap forward in terms of audio quality compared to the outgoing 800 Series. The diamond dome tweeter is now a quad-magnet design, which increases efficiency and improves the dynamic range of the top-end performance. A new surround material aids dispersion characteristics, and provides a more stable stereo image while increasing openness. At the other end of the tonal scale, bass performance has also improved with the introduction of a new dual magnet motor system, which utilizes powerful neodymium magnets. This innovative design improves the linearity of the bass drivers' performance, therefore reducing harmonic distortion. Serious work has also gone into the small details that combine to make a loudspeaker special. New Bowers & Wilkins-designed oxygen-free-copper speaker terminals and links ensure the signal quality into the speaker is the best possible. All models' crossovers feature a new design of capacitor using a unique silver, gold and oil construction. This component, chosen subjectively by Bowers & Wilkins engineers, in itself provides a dramatic increase in sound quality. Elsewhere, proprietary Bowers & Wilkins technologies such as Kevlar® FST™ mid-range drivers, Nautilus™ tube-loaded tweeters, Matrix™ enclosures and the unique sphere/tube heads on the two largest speakers in the range, remain as acoustically valid as ever. 800 Series Diamond is fully manufactured in the UK, at Bowers & Wilkins new cabinet factory in Worthing, West Sussex. All seven speakers feature attractive new design touches, and are available in a choice of three finishes: Rosenut, Cherrywood and a stunning new Piano Black gloss. The 805 Diamond is possibly the most requested speaker that Bowers & Wilkins has never made… until now. This groundbreaking book shelf model sees diamond tweeter technology arrive in the most affordable, real world speaker yet, and brings this level of stunning audio performance into the reach of many discerning listeners for the first time. The 804 Diamond is the smallest floorstander in the range, and has a similar footprint to the 805 Diamond when placed on the stand. And like the 805 Diamond it too benefits from the implementation of a diamond dome tweeter for the first time. The 803 Diamond provides people with more conservative taste many of the benefits of the 800 Series Diamond's range-topping models, but in a more traditional floorstanding speaker design. It has a significantly reduced footprint from the speakers above it, and utilizes three 7-inch bass drivers rather than the 802 Diamond's twin 8-inch cones. The 802 Diamond is the home-friendly version of the 800 Diamond. It offers many of the benefits of the flagship speaker, including the distinctive head unit, but with a reduced footprint for fitting into living environments. A new voice coil and bass realignment means that the 802 Diamond benefits from dramatically improved bass performance. The 800 Diamond is the flagship of the range, and is the latest incarnation of the speakers used in Abbey Road Studios. This no-compromise performer is better than ever, benefiting from all of the series-wide developments, and featuring significantly improved bass thanks to a new voice coil and bass realignment, which provides fuller, and more consistent bottom end performance. The new 800 Series Diamond also features two dedicated centre channels for home theatre use. The larger HTM2 Diamond is the perfect partner for the larger speakers in the range. The more compact HTM4 Diamond, which again sees the introduction of diamond tweeter technology in a real world centre speaker, is the perfect partner for systems comprised of 805 or 804 Diamond. A number of speakers have been removed from the previous 800 Series in this new slimmed down range, including the 801D and any dedicated rear channel speakers; the latter, because customers usually chose 805s over these options.